Texas Strong | Dirty South Bats - "Use them or lose to them"
Following up our Dirty South salute to the Lone Star State with the Texas Big, comes the Texas Strong. 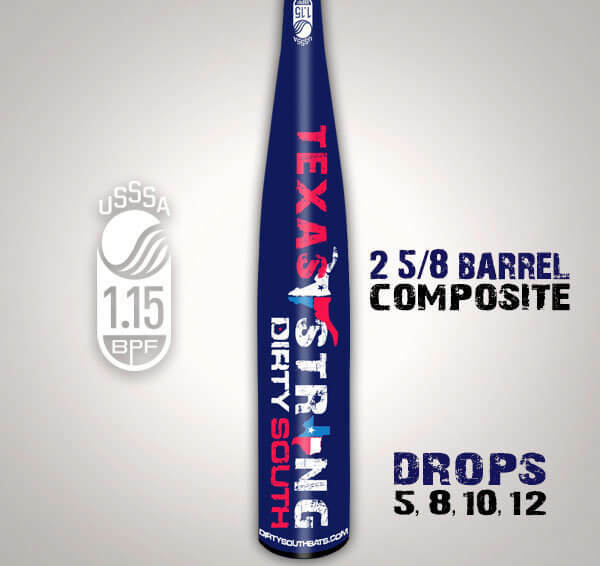 Texas Strong is not a limited edition bat, since we can not keep up with the demand. Texas Strong also represents all the continued improvements of our Swag line. 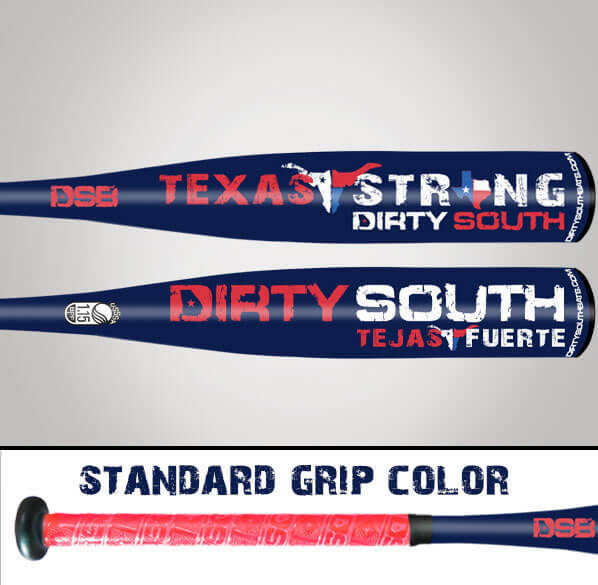 The state of Texas still ranks as number one or two in bat sales for DSB, so we have no problem continuing this tradition. You would be surprised to know that almost 50% of our Texas line gets shipped to non-Texas addresses. So take comfort in knowing that Texas Strong will be represented well in all of the Dirty South States. When will you start? Check out another good review here! Please do not charge me $5 addition for signature required delivery. I understand that DSB will not be responsible should the chosen carrier prove that they delivered the bat to my address, but the bat went missing (i.e. it was stolen off my front porch). Following up our Dirty South salute to the Lone Star State with the Texas Big, comes the Texas Strong. 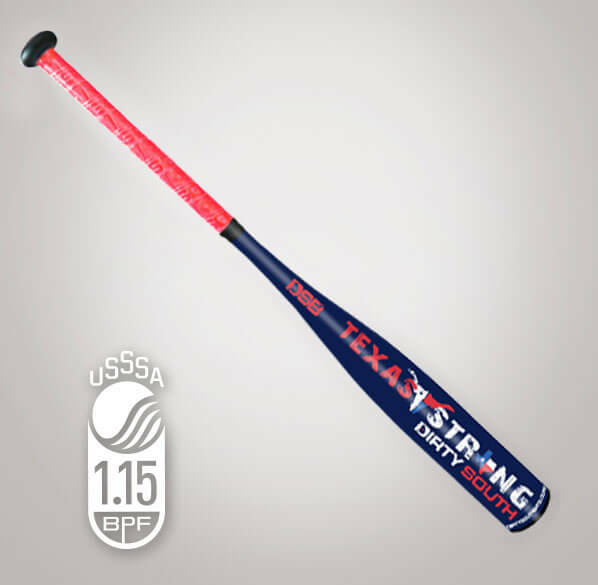 Texas Strong is not a limited edition bat, since we can not keep up with the demand. Texas Strong also represents all the continued improvements of our Swag line. 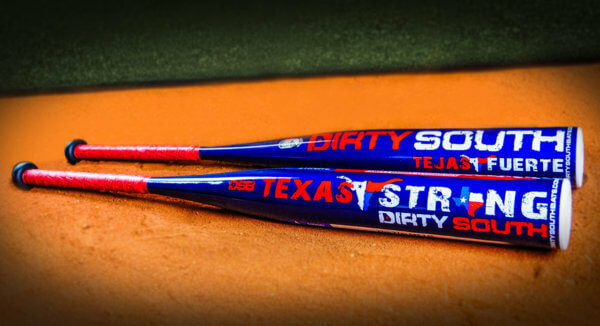 The state of Texas still ranks as number one or two in bat sales for DSB, so we have no problem continuing this tradition. You would be surprised to know that almost 50% of our Texas line gets shipped to non-Texas addresses. So take comfort in knowing that Texas Strong will be represented well in all of the Dirty South States. Check out another good review here! Bat performance excellence, my son loved it! Purchased a Texas Strong and received it last Friday. We used it in the cage Friday night to break it in and in a tournament last weekend. The bat rocks and turns outs into base hits due to the fact that the ball jumps off the bat really well. Some of the other kids’ parents asked about the bat and they could tell my son has a lot more confidence using you product. Thank you for making a quality product! Hot straight out of the box! Excellent bar all around! Nice balance and pop, after some breaking in. The -8 is a nice transition as he prepares for BBCOR in coming years. My son hit about 25 balls in the batting cage with it and couldn’t believe how fast the ball came off the bat. He loves it and can’t wait to hit at the field. Thanks a lot for all the help and we can’t wait to purchase our next bat from DSB. The bat is great!!! It does have lots of pop and my son loves it! Thank you again for the fast shipping as well!!! My son loves the bat. No game swings yet as it was a Christmas present, but we’ve done some indoor cage work it’s been impressive. Bat shipped very quickly. We’ve had this bat for about 2 months. Immediately turned infield hits into base hits over infielder’s heads and got several long bombs. Added confidence to a smaller statured 13U player that has always hit for contact, not power. My son says he almost never feels the ball hit the bat so maybe the “sweet barrel” is true. Bat sounds different than any other. The knob broke off the bat on a hard line drive shot in the cage after about 2 weeks but they repaired it immediately. I needed the bat for a tournament on the weekend so I called in to see what could be done. Samantha answered my call and gave me all of the options she had. She even looked thru current inventory for a trial bat in that size. When she couldn’t find one she offered to pay overnight shipping one way if I paid the other way. She stayed in contact with me every step of the way. Sent bat out on Wed afternoon and had back in my hand Friday morning!!! Cost me about twenty bucks to get my player back in action in 2 days. Awesome customer service backing a great product!!! Will definitely order again as my son grows. Great bat with huge sweet spot on the drop 5. My son just turned 13 and is lauching the ball 300+ ft in bp , and thats right out of the box. I think as it breaks in more the bat will only get better. 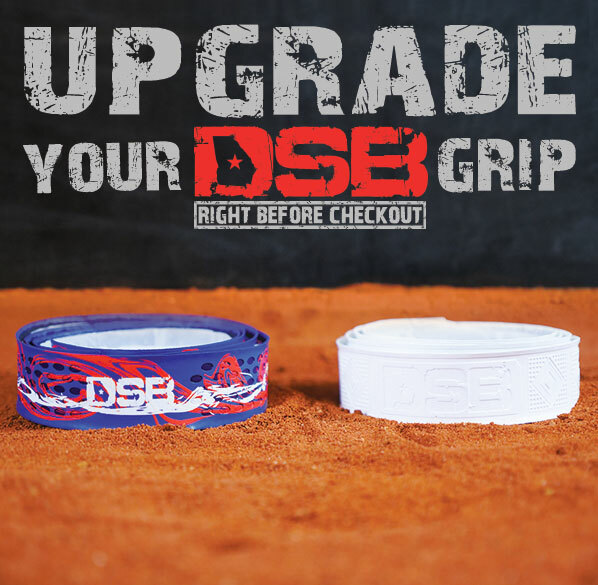 DSB was also super responsive when I sent messages with questions, great overall product very happy with purchase. My son LOVES this bat!! He says the pop is unbelievable… I say it finally gives him those extra few feet to hit the ball over the fence and not just to it. Great investment, thank you. My son went from 29/-10 DSB Swag to the 30/-8 and couldn’t be happier with the performance to date…it has a great balance feel and was hot right out of the wrapper. Very good bat, has a lot of pop!! Absolutely spectacular! We did a distance test (15 balls off tee) with his existing bats (VooDoo, and Hex) the DSB was on average 25-30 feet further out of box, can’t wait to see what it will be once broke in. This is my 10 year old sons second DSB and he loves it. His first BP with it he hit two homeruns back to back. This bat and the USA Made bat we purchased have performed great.